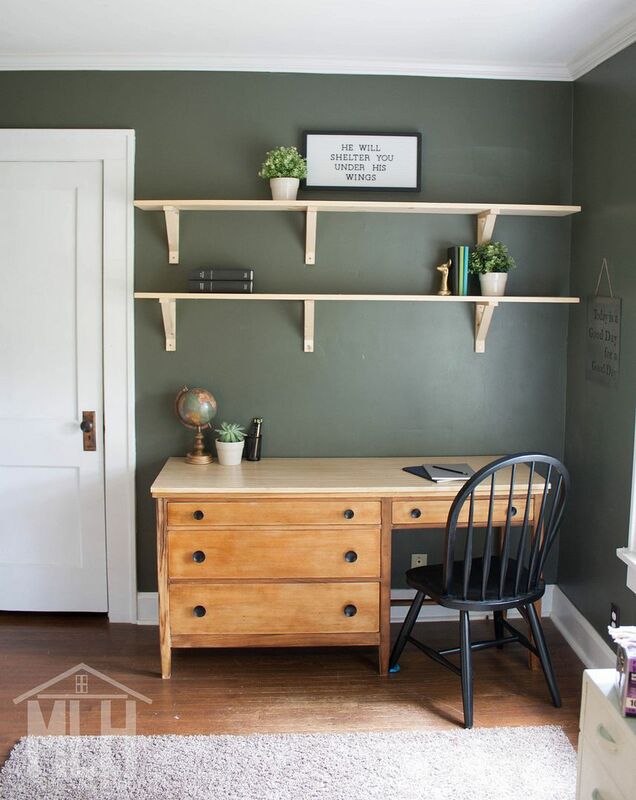 Remember this office space refresh I pulled off for just $35? It's one of my favorite corners of the house, and I still can't get over how little it cost to make this beautiful nook! One way I kept my budget low was by making my own wood stain and wood sealer with household items I already had on hand. So today I'm sharing how you can make your own - and it's easier than you might think! You can see the very sad "before" photos and the rest of the details here. I went back to my decorating roots for this one. And at my roots... I'm cheap. I come from a low budget use-what-you-have background and I wanted to update this space as inexpensively as possible, while still creating a beautiful space I love to work in. Because, guys, at my core I believe that any house can become not just a home, but a home you love, without spending a fortune. You can stick to a small budget and still do amazing, beautiful things! So I set my budget at $50 but wanted to stay as far under it as possible - literally not spend a dime more than I had to. 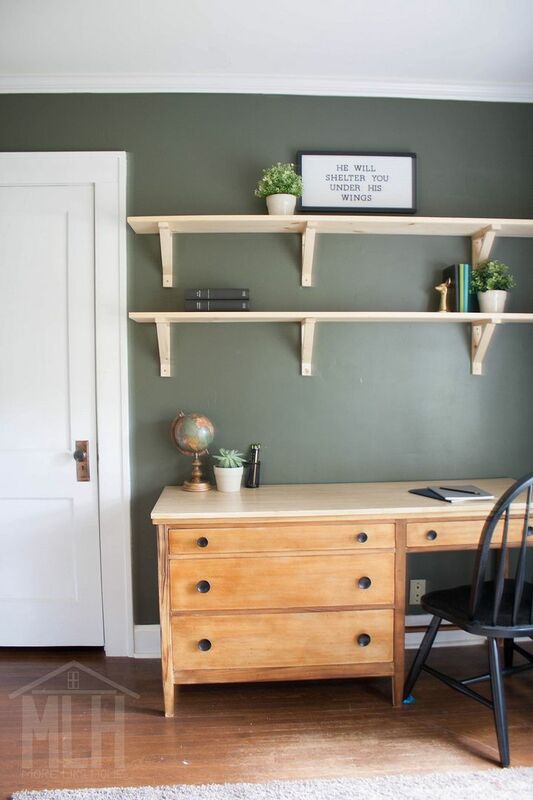 I added some DIY budget shelving and a second-hand chair, but the real star of this makeover was a super budget-friendly desk! I started hunting for a desk first because I knew a large piece like that would make or break my budget. If I spend too much on that one item, I wouldn't have budget left for the other upgrades I wanted. 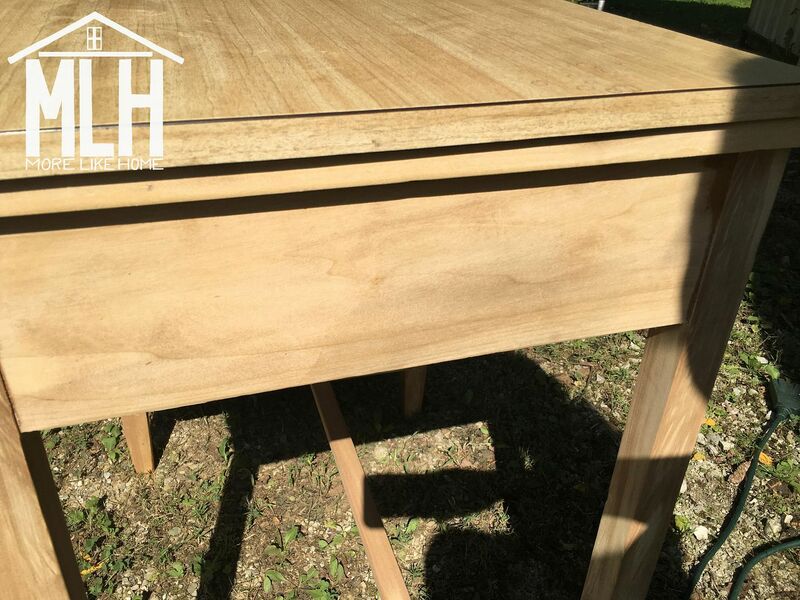 I ended up finding a perfectly-sized desk for a bargain (more on that in a minute) but the finish was in rough shape. That's probably why the price was so low. 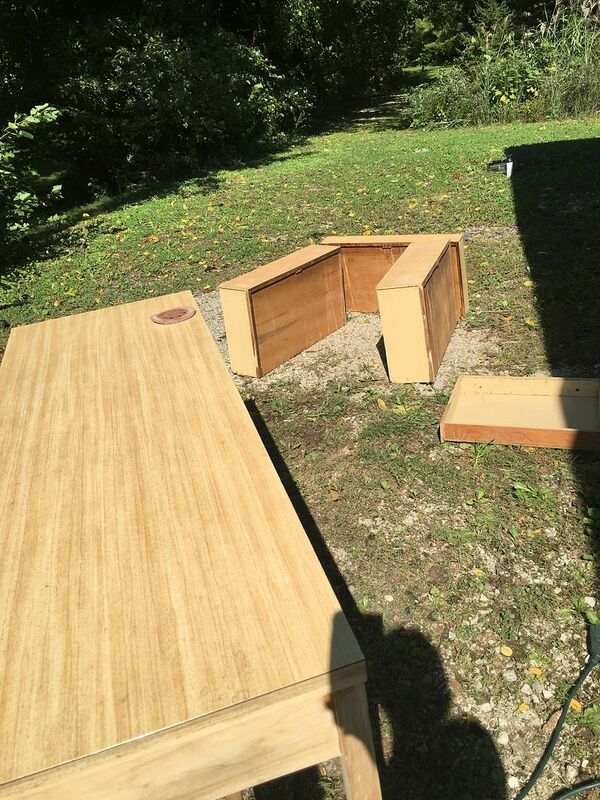 I wanted to try sprucing it up without spending $$ on new stain or poly, so I took to the interwebs and you know what? 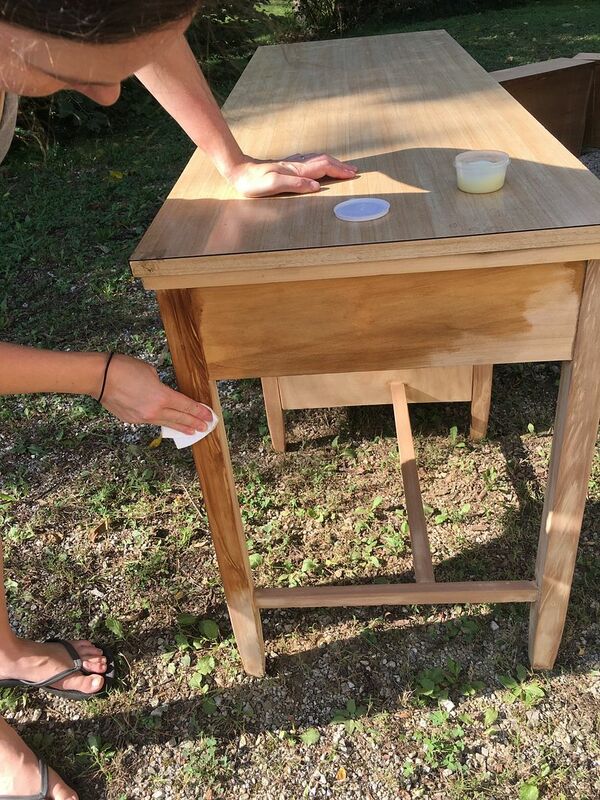 Turns out you can make your own wood finish products with everyday items you might already have around the house! I actually had everything I needed! But let's start with the desk story. This desk popped up on FB marketplace one day and it seemed like a good fit for this space. Just the right size, plenty of drawer space, and a perfect fit for my simple style (because I "like plain"). 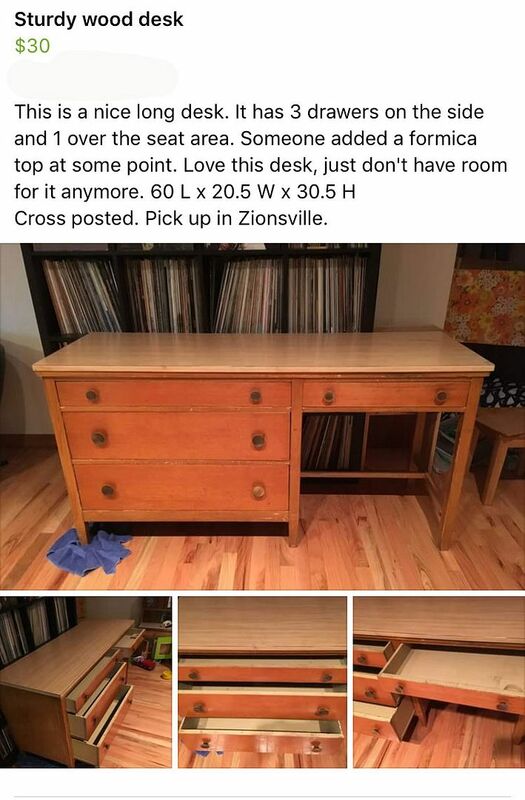 I saw it posted for $30, but it had already been listed for a week so I offered $20 (and offered to pick it up that night! - most people want to get rid of things quickly and will give you a deal for fast pick-up!) and they said yes! I brought it home and sanded off the old finish. I also tried to remove the laminate top that had been added at some point... and discovered a huge hole cut in the original top. Bummer. So for now it went back on. 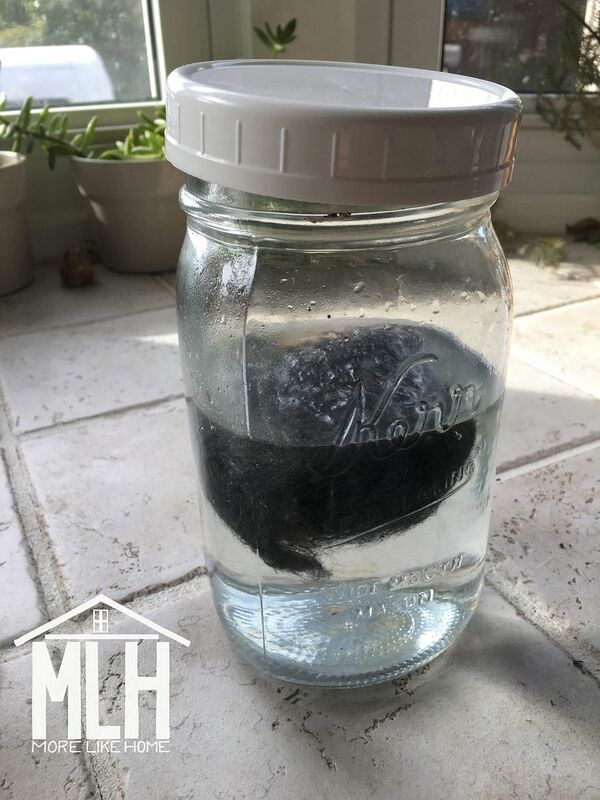 Short instructions: drop steel wool into a mason jar. Cover it with vinegar (make sure you use enough to for your whole project!). Let it sit in a quiet spot like under the sink with the lid vented for 24 hours, then remove the steel wool. BOOM. Stain. Apply it to your wood and let it dry. It looks almost unchanged, apart from a little rust on the steel wool. 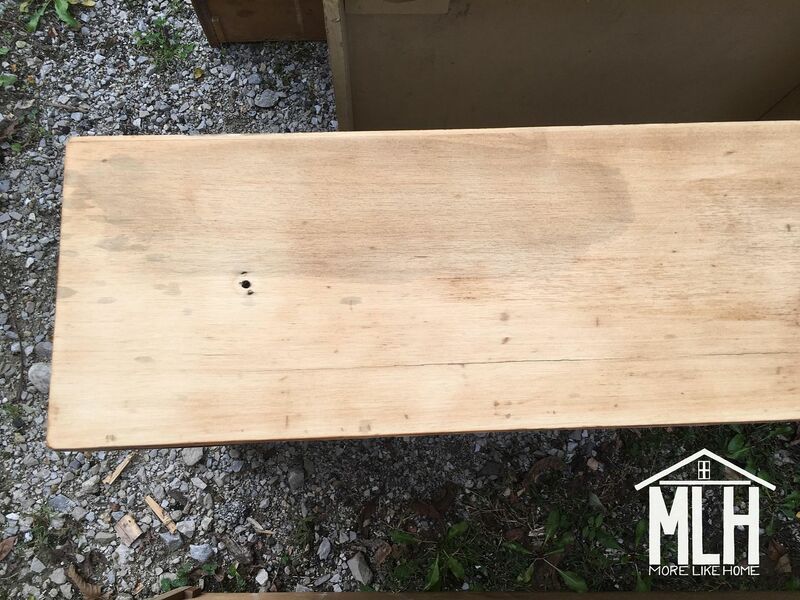 It gets more rust-tinged the longer it sits, but it will still stain your wood looking like this! It's crazy. the biggest downfall in this method is that it's unpredictable. You don't know for sure what color you will get until the stain dries. And you probably won't be able to recreate the exact same color twice, so make sure you make enough the first time! I made a first batch of stain and applied it to half of one drawer before m3 tripped on it and spilled the entire thing. I had to sand that whole drawer down because it didn't match my second batch. 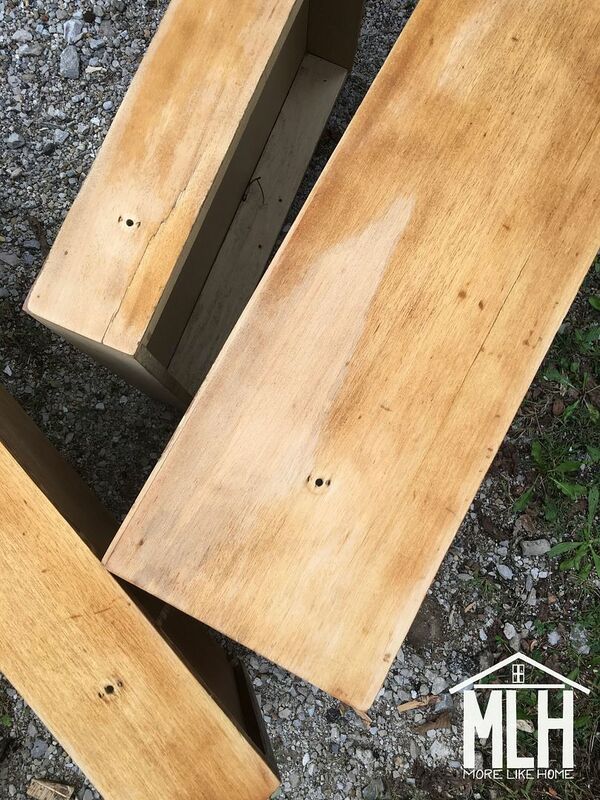 when you first apply the stain you won't notice any change apart from the wood being wet, but as it sits it will begin to get darker. It actually reacts with the wood to change its color and that takes time! According to pinterest it can take up to an hour for it to reach its final color. So if it's not looking as dark as you hoped, be patient and see how it turns out when it's done reacting. since I wanted such a light color, I used a small piece of steel wool and let it sit for just 18 hours. This worked to make a nice light change for my first batch, but with my second I used a less-fine steel wool and it definitely wasn't long enough. Oops. You can see my test spot in the photo below. Just a slightly darker, grayish patch. Plus some splatters from the first batch spill that I didn't realize splashed on this drawer. I loved the color once it was all stained. And if you want it to stay the color (or at least close to it) you should probably try sealing it with a regular polyurethane. But... I again took the cheap DIY route with a homemade beeswax + olive oil sealer. And it dramatically changed the color of the wood. I don't know how much difference the stain in the final color. 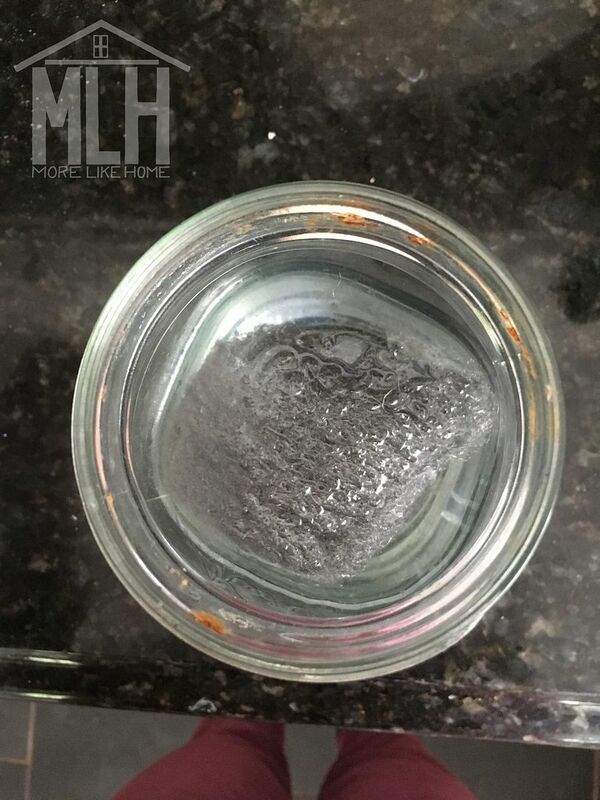 Melt the two ingredients together in a double boiler (or glass bowl over a pot of simmering water) until combined. Let it cool slightly before pouring it into a container, then let it cool completely. Once it's cool you can apply it to your wood with a soft rag (or piece of an old tshirt). Fun fact: this is actually the same wood sealer recipe that I use to seal my wooden teething toys! You can read more about the process with photos in my teething ring post. See how much darker?! And more yellow. I don't know how much of that is from the sealer and how much is the undertone of the wood. I should have done a test spot of poly to compare. My bad, guys. Honestly, I was pretty disappointed when that beautiful gray tinge disappeared into this darker, more yellowish finish. Ugh. Fortunately once I moved the desk into its new home, the color grew on me pretty quickly. And at the moment I'm very happy not to mess with it anymore. Sometimes that's all we can ask for. Apart from the color, I've been really happy with how the sealer actually worked and how it has help up so far. It smelled great, went on smoothly, and I haven't had any problems with it! I actually love having this finish in my wheelhouse, especially to use around the kids. With the desk done, we were ready to start moving things into our home office/library. Those sticky notes on the wall are my high-tech stud markers. 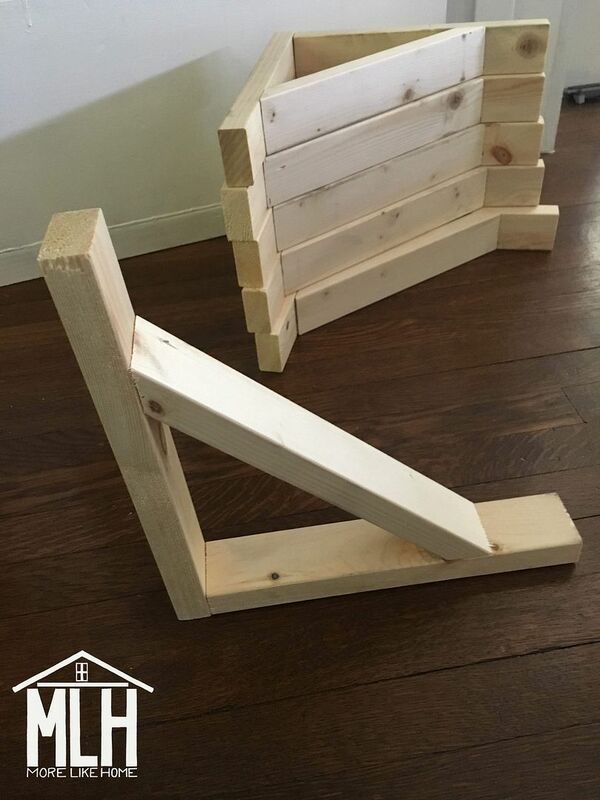 We hung simple shelves using these brackets I made for less than $1 each (more details on that here). Then slid the desk into place along with an extra chair from our dining set (another FB Marketplace find that I updated with black spray paint). 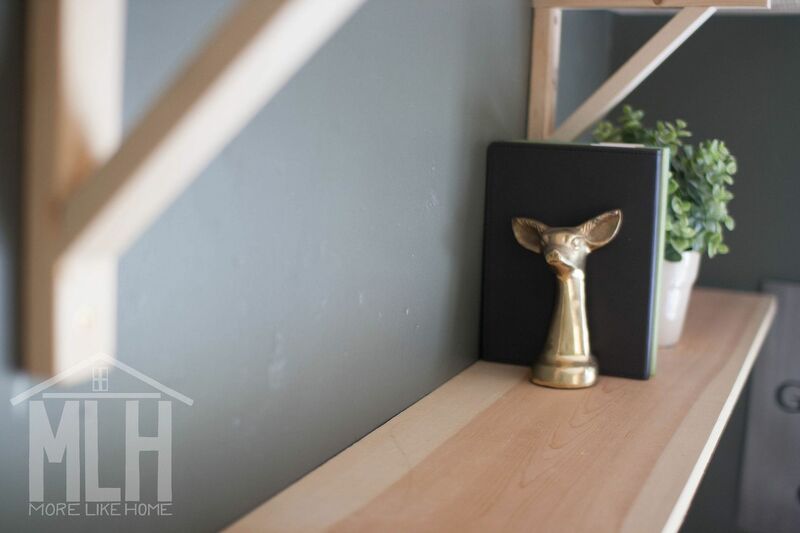 And that's the rest of the story on our low-budget office refresh! 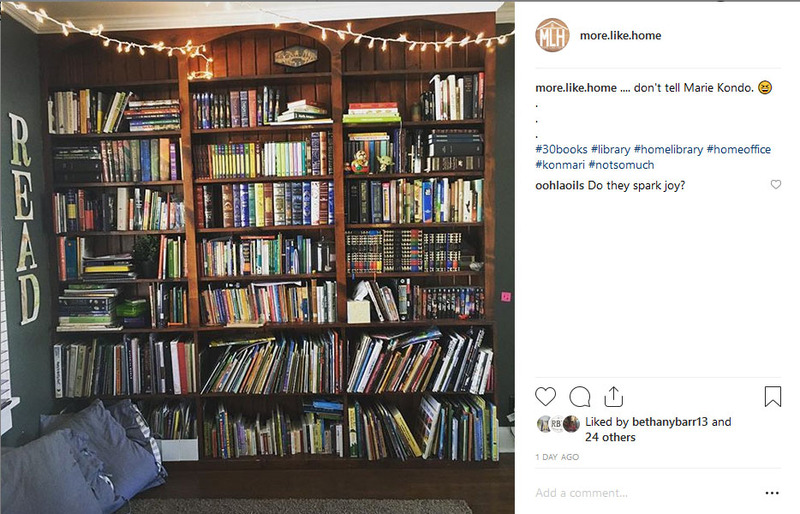 The only thing I've changed since the big reveal is adding a string of twinkle lights (that's what you call Christmas lights so you can leave them up year-round. you're welcome.) above the bookshelves on the opposite wall. This wall is why we call it a library instead of an office. Feeling inspired to tackle your own space on a budget? Always remember the best place to start: rearrange and work with what you have first. Then you can see where you really need to spend money to make the space the best it can be. After that, see what you can get second hand for low cost (I'm working on a post with my best thrifty shopping tips to help you out with this step!). Love this reminder from erkiabault! 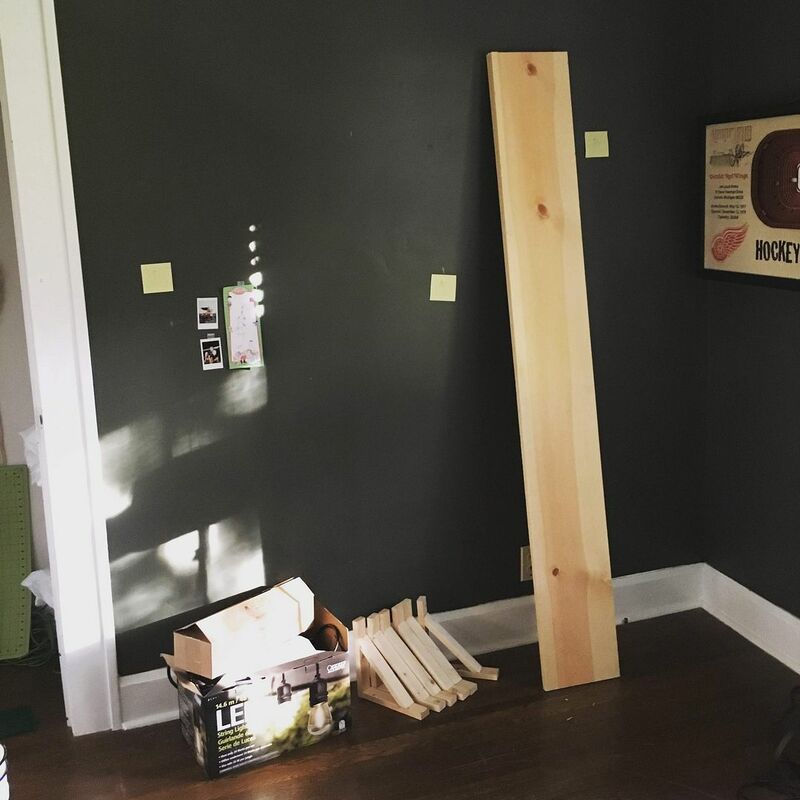 What space would you love to tackle on a small budget?